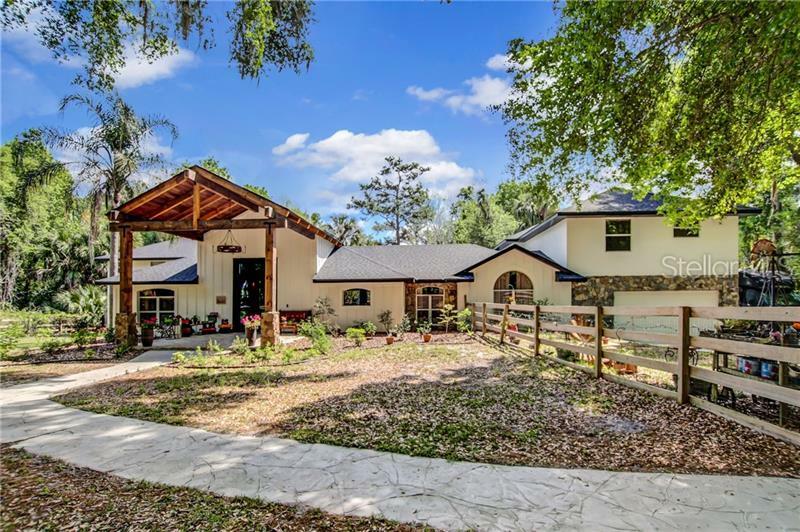 Beautiful, custom home on over 3 acres of land with Wekiva River frontage. Restored and updated in 2017 & 2018 with the utmost attention to detail. Property includes unique, custom furnishings and decor. The home boasts pine wood floors & shiplap walls that were brought in from Maine & tongue and groove pine wood ceilings & patio beams from North Carolina. New roof, dock, interior & exterior paint, 2018. Enjoy cooking in this custom kitchen with a large marble top island, custom wood cabinets & counter tops, Wolf double oven, Viking range & Sub Zero refrigerator/freezer. The wood accents in the kitchen & both master bedrooms are handpicked from a 170 year old barn providing quite the rustic charm. The upstairs master bedroom's private screened balcony allows you to sip your morning coffee while viewing the wildlife of the Wekiva Basin. The open concept is great for entertaining. The family room is large yet cozy with a custom Tennessee stone gas fireplace overlooked by the dining room and kitchen. The oversized back patio has an in-ground pool & large sitting area with granite countertops, sink, storage and mini fridge. There is a large room with private access in the patio that can be used as the 6th bedroom complete with full bath & closet, or a pool/game room with an additional screened patio. The patio overlooks the spacious backyard, private spring fed lagoon which trickles into a private canal that leads to the crystal clear Wekiva River. Make this one of a kind, rustic dream home yours!